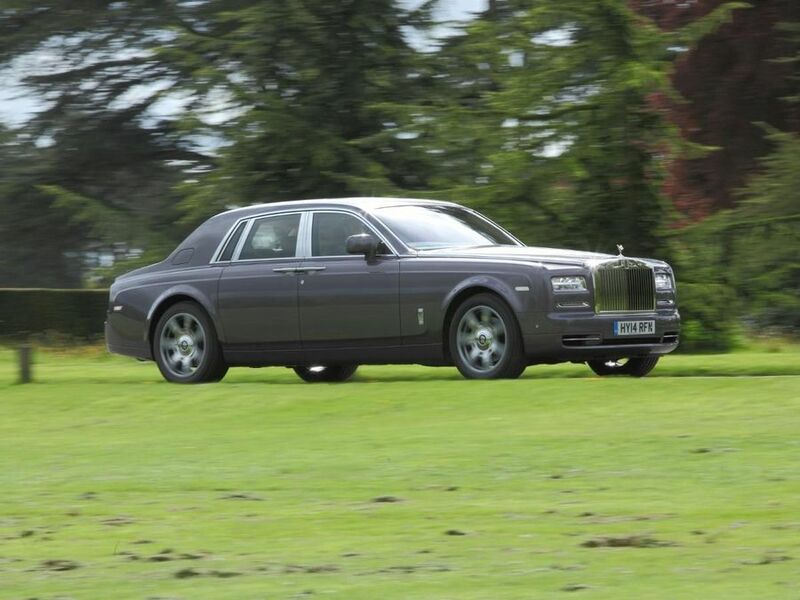 Read the Rolls-Royce Phantom saloon (2003 - ) car review by Auto Trader's motoring experts, covering price, specification, running costs, practicality, safety and how it drives. Exceptional quality, timeless elegance, surprising performance: the Rolls-Royce Phantom is the height of automotive aspiration. Interested in buying a Rolls-Royce Phantom? The Phantom was the first car to be built by Rolls-Royce after it was acquired by BMW in 1998. It remains a physical manifestation of just how seriously the German carmaker understands the sense of tradition and responsibility at Rolls-Royce, blending the best of British craftsmanship with German technology to create an old-world-meets-new-world tour de force. Nearly everything on the Phantom is built and finished by hand – the coach stripes, for example, take three hours to hand paint with a squirrel-hair brush. The car is nothing if not imposing, yet still manages to possess all the grace and immensity of the RMS Queen Mary. The Phantom’s cabin is BMW’s take on what the quintessential British luxury car should be and, to the firm’s great credit, the car feels every inch the inside of a Mayfair hotel. It simply exudes luxury thanks to perfectly book matched wood veneers that conceal the 8.8-inch infotainment screen, art deco lighting accents, acres of Alpine cattle hide, lambswool carpets and a light scattering of chromed switchgear. And, the further back you move in the Phantom, the better it gets. The Phantom is a full five-seater with four doors (a four-seater option is available, as featured in our video), with the rear doors possessing two party tricks: not only are they rear hinged to create a very practical aperture, they also conceal a pair of umbrellas that are teflon-coated so you can put them away wet without them rotting. Whichever seat you end up in, your surrounded by a huge amount of space, and the seats themselves feel more like armchairs than car seats. The 460-litre boot is as big as you get in a BMW 3-series Touring. Where ride comfort is paramount, the Phantom adopts obligatory air springs and is probably the best riding car we have ever tested. Almost no road surface is too broken, no pothole too deep, no hump too high to disturb the experience of wafting along in this supremely comfortable and cosseting car. There’s no disguising 2.5 tonnes of bulk, but body roll is tamed by the rigid aluminium space frame and the steering is suitably slow, light and wonderfully accurate. In recognition of the surprisingly high propensity of European owners who prefer to sit up front, a Driver’s Pack is available to firm up the suspension and provide the driver with a thicker diameter steering wheel. Under the Phantom’s bonnet is a hand-built, naturally aspirated 6.75-litre V12 engine that produces 453bhp and performs the 0-62mph sprint in 5.9 seconds, pretty impressive given the sheer size of the car. In normal driving conditions, however, the linear acceleration through the eight-speed gearbox is so smooth and the cabin is so insulated, you wouldn’t even know the engine is there. It’s a Rolls-Royce with a V12 engine, so the Phantom isn’t going to run on the loose change in your pocket (unless you’re a Russian oligarch or a talent show tycoon). Rolls-Royce quotes an official fuel consumption figure of just 19.1mpg and we were able to achieve this in our test. In a similar vein, CO2 emissions of 347g/km are unlikely to cause sleepness nights to any potential customers willing to spend six figures on a car. The Phantom doesn’t sell in sufficient numbers to show up in customer satisfaction surveys, and Rolls-Royce owners tend to be sufficiently private and discreet to not make any problems with their cars public. That said, every Rolls-Royce is hand built by highly trained and skilled craftspeople in a purpose-built facility in Goodwood, so it’s unlikely that there will be any major problems. And, when you factor in that many components tend to be supplied by parent company BMW, and are likely to be tried and tested in models such as the 7 Series, the result should be a very reliable car. All car occupants are equal, but the chances are that those in a Rolls-Royce Phantom would consider themselves to be more equal than others. Not only is the Phantom the same size as a barge, it incorporates all the latest passive and active safety technology including airbags, crumple zones and an Intelligent Safety and Information System (ISIS) that makes 4,000 calculations per second to detect any potential incidents. Positioning the rear seats behind the rear window pillars negates the need for side-impact airbags, too. Thanks to an established bespoke program, the equipment list on a Phantom is limited only by your imagination, whether it’s a gold-plated Spirit of Ecstasy, stitching your family crest into the chairs or installing a humidor in the glovebox. The standard set-up, however, does include a 15-speaker, studio-grade sound system and an intuitive infotainment system based on BMW’s iDrive. The Rolls-Royce Phantom is a truly exceptional car. It may be unapologetically costly, but that simply reflects the value of what it costs to make. There is no better car in the world to be chauffeured around in, but it’s almost equally satisfying to drive yourself.